The High School Science Teacher is responsible for job tasks, like developing the curriculum and teaching them to students. 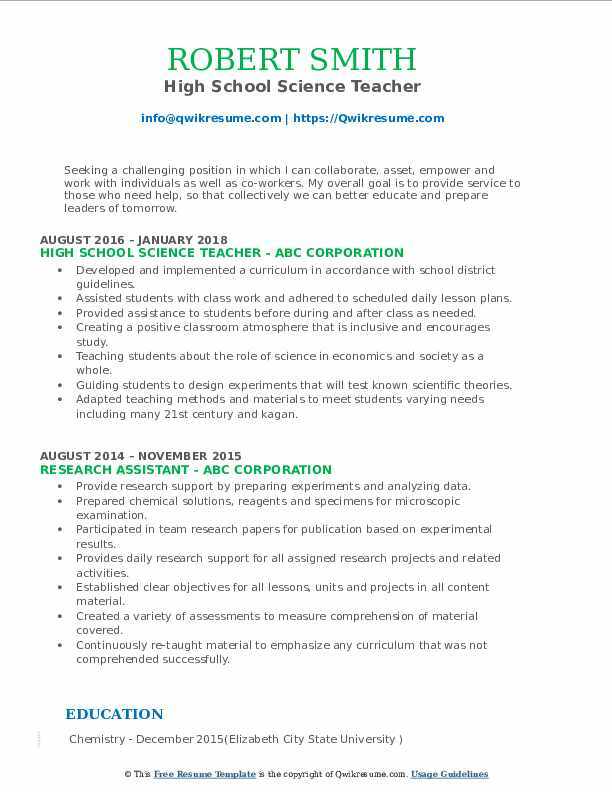 Some of the other important job duties that can be commonly seen on a High School Science Teacher Resume are: to give and evaluate students’ assignments, to mentor students, to collaborate with teachers and parents, to teach science to students in the most interesting way possible, to plan and supervise science projects and activities. To embark on this challenging career, you need to have certain important and mandatory qualifications and characteristics, like excellent theoretical and practical knowledge in science, exemplary educational background, and up to date knowledge in the current trends in the field of science. The minimum education required to apply for this role is a Bachelor’s Degree in domains like Science. Special preference will be given to people with relevant work experience, Master’s Degree or Specialization in the relevant field, and/or renowned certification in the pertinent domain. 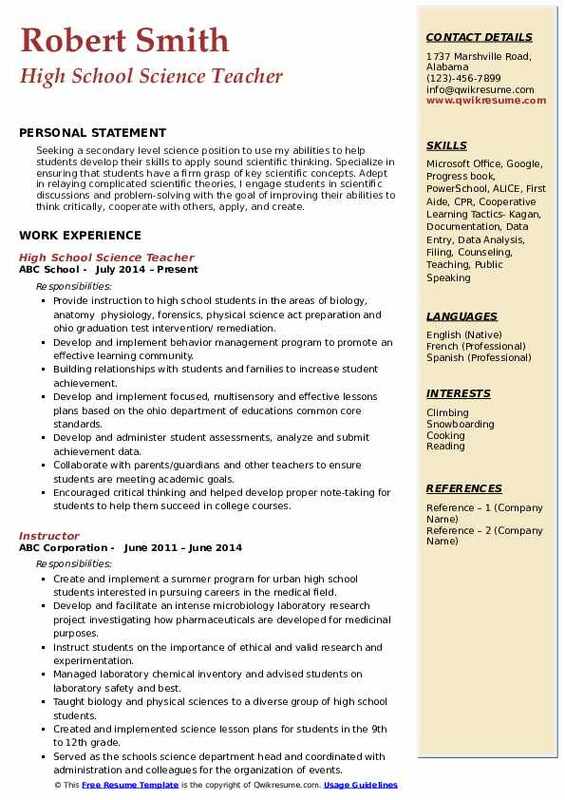 Summary : Seeking a challenging and long-term position at High School Level to share my subject matter expertise. Dedicated 16 yrs to encourage students in scientific discussions and maintaining strong bonds with parents. 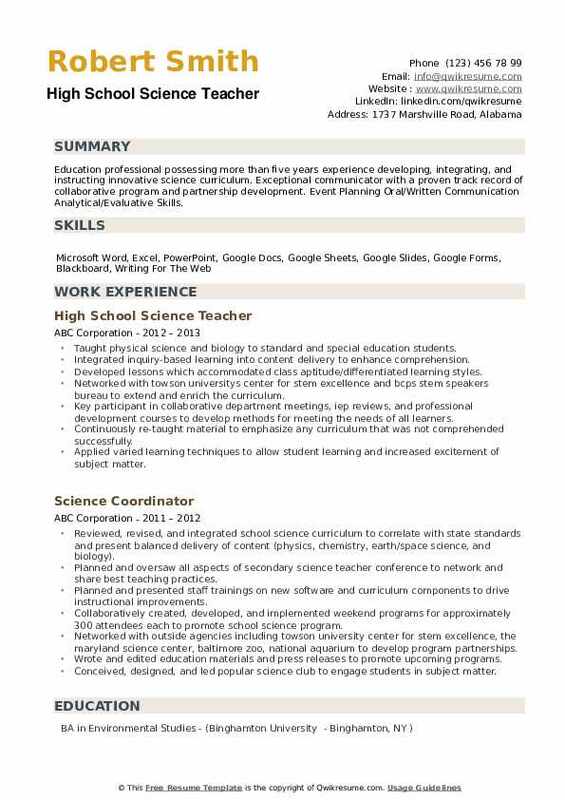 Skills : Good Inter personnel Skills, Expertise in Chemistry, Biology & Physics.Well versed in MS Office and Powerpoint. Served as department chair of science department; mentored new science teachers in learning lab systems and teaching expectations. 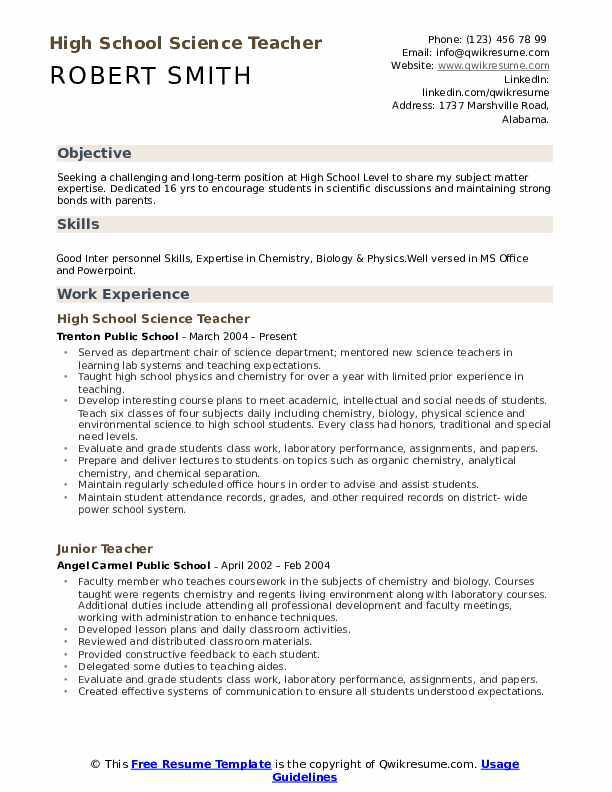 Taught high school physics and chemistry for over a year with limited prior experience in teaching. Develop interesting course plans to meet academic, intellectual and social needs of students. Teach six classes of four subjects daily including chemistry, biology, physical science and environmental science to high school students. Every class had honors, traditional and special need levels. Evaluate and grade students class work, laboratory performance, assignments, and papers. Prepare and deliver lectures to students on topics such as organic chemistry, analytical chemistry, and chemical separation. Maintain student attendance records, grades, and other required records on district- wide power school system. Supervise laboratory work and teach proper use of chemicals and their interactions, danger signs, production techniques, and disposal methods. Conducted laboratory experience, projects and rubrics for motivational learning. Assess student learning formally and informally using a variety of assessments and grading rubrics. Implement student activities and projects using collaborative and individual learning approaches. Motivated students to achieve 90% final exam pass rate, well-above national average. Design, instruct, and implement instructional documents and assessments. Assess and resolve training development plans, problem-solving class management, lesson scheduling, and supply coordination. Attend meetings and contribute to training and development plans. Learned many techniques for classroom management and balancing teaching methods for a preferred learning environment. Coordinated with science teacher colleagues and communicated with parents, family members, and allied school administrators. Developed and led chemistry and biology lab programs. Instructed honors biology, honors chemistry, and college prep chemistry courses. Held instrumental role in creating and launching new courses that meet with state and school regulatory guidelines for excellence in science education. Contributed to building positive student relationships through participating in planning and launching special events including fundraisers, proms, and graduations. Summary : A highly motivated, intuitive and result focused individual with 21 years of successful experience in diversified environments as an educator. 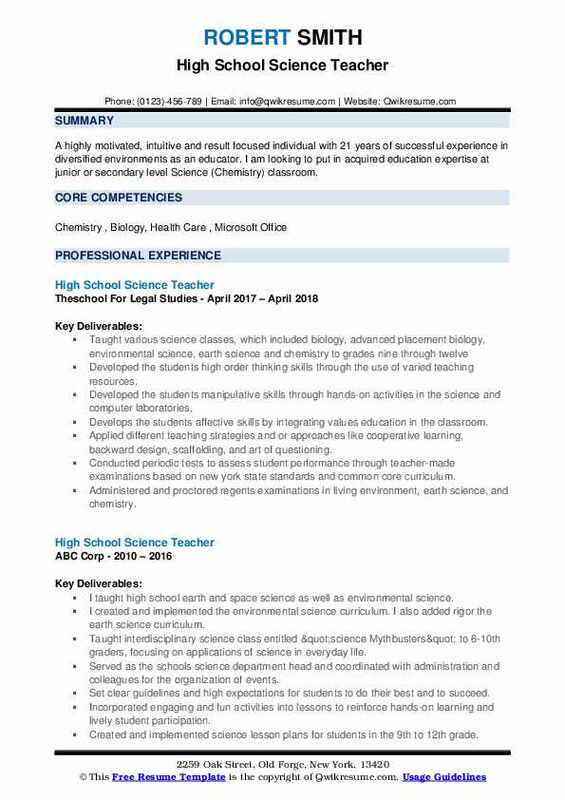 I am looking to put in acquired education expertise at junior or secondary level Science (Chemistry) classroom. Developed the students high order thinking skills through the use of varied teaching resources. Developed the students manipulative skills through hands-on activities in the science and computer laboratories. Develops the students affective skills by integrating values education in the classroom. Applied different teaching strategies and or approaches like cooperative learning, backward design, scaffolding, and art of questioning. Conducted periodic tests to assess student performance through teacher-made examinations based on new york state standards and common core curriculum. Administered and proctored regents examinations in living environment, earth science, and chemistry. Scored new york state english language arts and mathematics tests, regents examinations in chemistry, earth science and living environment. Used rubrics to assess lab reports, homework, classwork, projects, and examinations. Established rapport with parents through letters, conferences and telephone calls. Instructional shifts from the new york state standards to the common core learning standards. 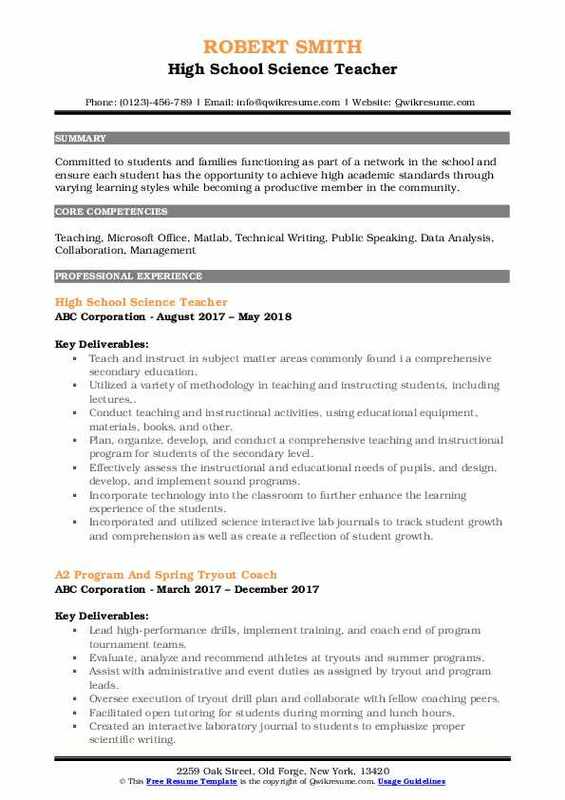 Summary : A 13 year experienced secondary teacher seeking a part time or full time employment in either education or fitness. 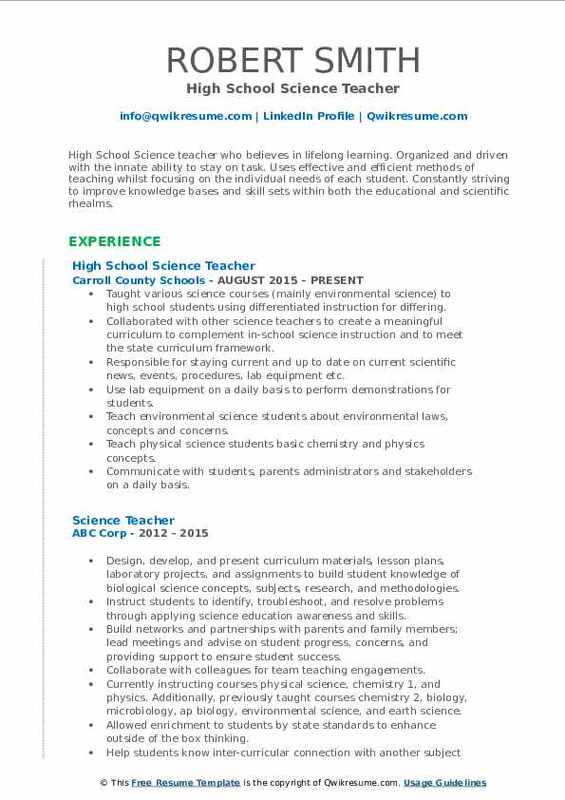 Work with colleagues to develop science pathway for education from 9th-12th grade. Collaborate with other environmental science teachers to provide a consistent course of study. Incorporate benchmarks into curriculum to monitor and adjust for student growth. Implement school approved curricula and include state standards into lesson plans. Administer successful proactive classroom management plan with all classes. Develop strong relationships and communication with parents from varied backgrounds through email, phone, conferences and written correspondence. Participate in staff meeting and complete proper professional development requirements. Create innovative real world lesson plans that are based on current environmental issues. Objective : High School Science teacher who believes in lifelong learning. Organized and driven with the innate ability to stay on task. Uses effective and efficient methods of teaching whilst focusing on the individual needs of each student. Constantly striving to improve knowledge bases and skill sets within both the educational and scientific rhealms. Taught various science courses (mainly environmental science) to high school students using differentiated instruction for differing. Collaborated with other science teachers to create a meaningful curriculum to complement in-school science instruction and to meet the state curriculum framework. Responsible for staying current and up to date on current scientific news, events, procedures, lab equipment etc. Use lab equipment on a daily basis to perform demonstrations for students. Teach environmental science students about environmental laws, concepts and concerns. Teach physical science students basic chemistry and physics concepts. Communicate with students, parents administrators and stakeholders on a daily basis. Use google drive, google docs, google sheets, and google forms on a daily basis to share information with colleagues. Summary : Accomplished and energetic High School Science Teacher with a solid history of achievement in teaching.Motivated leader with strong organizational and prioritization abilities. Establish and enforce rules for behavior and procedures for maintaining. Demonstration, and work time that provides students with opportunities to observe, question, and investigate. Confer with other staff members to plan and schedule lessons promoting. Prepare and deliver lectures to undergraduate or graduate students on topics such as organic chemistry, analytical chemistry, and chemical. Headline : Engaging high school science teacher skilled at encouraging and inspiring high school students. Strives to reach out to students to help them reach the highest level of academic success possible. 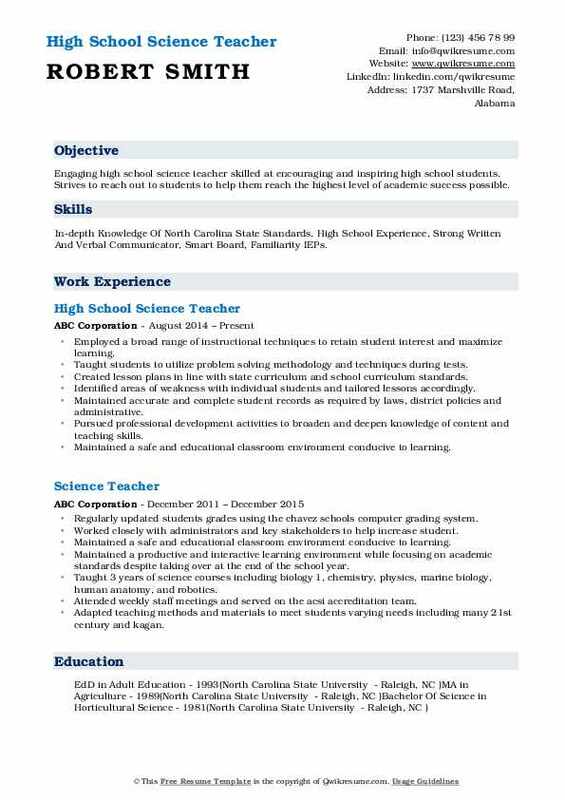 Skills : In-depth Knowledge Of North Carolina State Standards, High School Experience, Strong Written And Verbal Communicator, Smart Board, Familiarity IEPs. Employed a broad range of instructional techniques to retain student interest and maximize learning. Taught students to utilize problem solving methodology and techniques during tests. Created lesson plans in line with state curriculum and school curriculum standards. Identified areas of weakness with individual students and tailored lessons accordingly. Maintained accurate and complete student records as required by laws, district policies and administrative. Pursued professional development activities to broaden and deepen knowledge of content and teaching skills. Maintained a safe and educational classroom environment conducive to learning. Regularly updated students grades using paul pcss computer grading system. Summary : Seeking a challenging position in which I can collaborate, asset, empower and work with individuals as well as co-workers. My overall goal is to provide service to those who need help, so that collectively we can better educate and prepare leaders of tomorrow. Developed and implemented a curriculum in accordance with school district guidelines. Assisted students with class work and adhered to scheduled daily lesson plans. Provided assistance to students before during and after class as needed. Creating a positive classroom atmosphere that is inclusive and encourages study. Teaching students about the role of science in economics and society as a whole. Guiding students to design experiments that will test known scientific theories. Adapted teaching methods and materials to meet students varying needs including many 21st century and kagan. Managed classrooms of 7 to 27 high school and middle school students through various content material and educational levels. Differentiated instruction and accommodated lessons for special needs students. Preparation and instruction of curriculum incorporating state benchmarks to a diverse student population. Objective : Committed to students and families functioning as part of a network in the school and ensure each student has the opportunity to achieve high academic standards through varying learning styles while becoming a productive member in the community. Teach and instruct in subject matter areas commonly found i a comprehensive secondary education. Utilized a variety of methodology in teaching and instructing students, including lectures,. Conduct teaching and instructional activities, using educational equipment, materials, books, and other. Plan, organize, develop, and conduct a comprehensive teaching and instructional program for students of the secondary level. Effectively assess the instructional and educational needs of pupils, and design, develop, and implement sound programs. Incorporate technology into the classroom to further enhance the learning experience of the students. Incorporated and utilized science interactive lab journals to track student growth and comprehension as well as create a reflection of student growth. Developed successful transition activities so students had the ability to utilize every minute in class effectively. 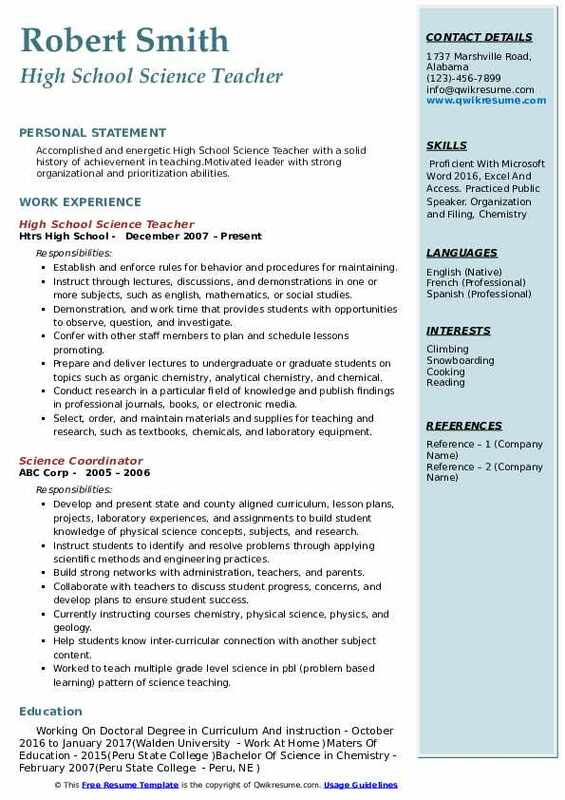 Summary : Seeking a secondary level science position to use my abilities to help students develop their skills to apply sound scientific thinking. Specialize in ensuring that students have a firm grasp of key scientific concepts. Adept in relaying complicated scientific theories, I engage students in scientific discussions and problem-solving with the goal of improving their abilities to think critically, cooperate with others, apply, and create. 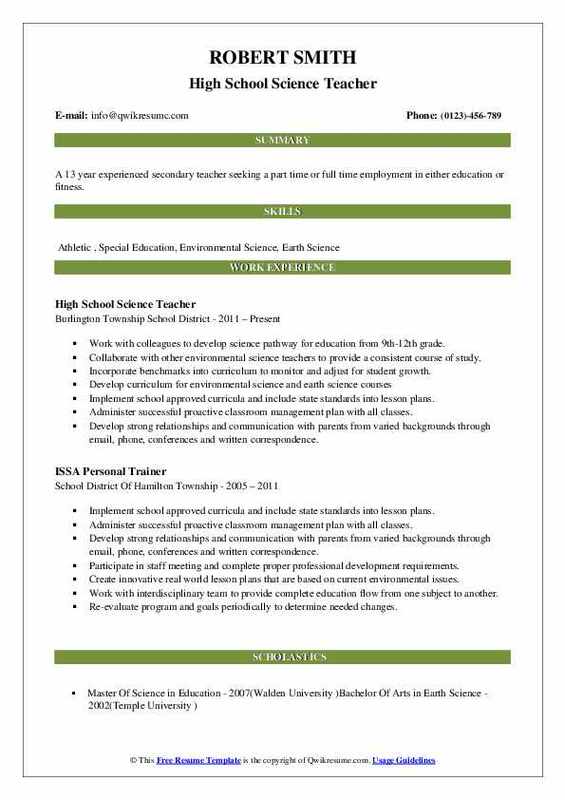 Provide instruction to high school students in the areas of biology, anatomy physiology, forensics, physical science act preparation and ohio graduation test intervention/ remediation. Develop and implement behavior management program to promote an effective learning community. Building relationships with students and families to increase student achievement. Develop and implement focused, multisensory and effective lessons plans based on the ohio department of educations common core standards. Develop and administer student assessments, analyze and submit achievement data. Collaborate with parents/guardians and other teachers to ensure students are meeting academic goals. Encouraged critical thinking and helped develop proper note-taking for students to help them succeed in college courses. Created focused and challenging lessons for three different preps at the high school level. Summary : Education professional possessing more than five years experience developing, integrating, and instructing innovative science curriculum. Exceptional communicator with a proven track record of collaborative program and partnership development. Event Planning Oral/Written Communication Analytical/Evaluative Skills. Taught physical science and biology to standard and special education students. Integrated inquiry-based learning into content delivery to enhance comprehension. Developed lessons which accommodated class aptitude/differentiated learning styles. Networked with towson universitys center for stem excellence and bcps stem speakers bureau to extend and enrich the curriculum. Key participant in collaborative department meetings, iep reviews, and professional development courses to develop methods for meeting the needs of all learners. Continuously re-taught material to emphasize any curriculum that was not comprehended successfully. Applied varied learning techniques to allow student learning and increased excitement of subject matter. Designed highly engaging learning opportunities to support students to succeed and evolve science skills to the next academic level.